NEW YORK, United States – Young people are an engine for progress, but their potential future will go unfulfilled if they are not empowered, said UNFPA Executive Dr. Director Babatunde Osotimehin and actress and activist Ashley Judd, at the Social Good Summit held yesterday in New York. The Social Good Summit, through livestreamed panel discussions and community meet-ups around the world, engages activists to discuss solutions to global challenges. 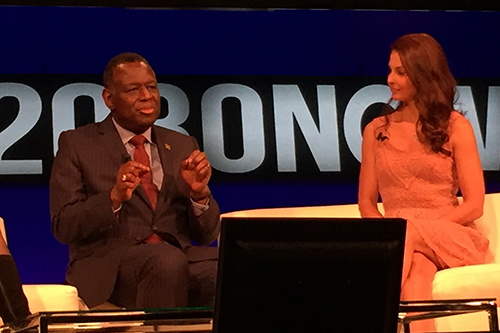 Dr. Osotimehin and Ms. Judd tackled the issue of empowering youth to change the world. Yet their rights are too often undervalued and overlooked, and they are often excluded from decision-making processes and opportunities. This is particularly true for adolescent girls. For many, child marriage and lack of access to school are daily realities. Pregnancy in adolescence, often the result of child marriage, also increases their risk of death and disability. Ms. Judd – a human rights advocate who has done work with Population Services International (PSI) and other organizations – emphasized that reaching adolescent girls benefits not only girls themselves, but whole countries. “As we know, for every additional year of secondary school a girl is able to attend, her earnings increase by 10 to 20 per cent,” she noted. Cumulatively, these gains are shown to increase countries’ gross domestic product, she added. “Economic autonomy and independence also decrease their chance of [becoming victims of] gender-based violence and increase their efficacy and agency within the household,” she said. Young people also need access to sexual and reproductive health care. This includes information, health services, and family planning counselling and commodities. But the connection between family planning and the potential of young people – especially young women – to contribute to their communities is often lost on policymakers. “I don’t want us to go away from here thinking family planning is just about planning families. It is about empowering women,” Dr. Osotimehin said, in a statement that received enthusiastic applause. Ms. Judd added that over 220 million “women of reproductive age in the world right now, including adolescent girls,” lack access to modern family planning. Yet for women and girls, the means to choose when and whether to become pregnant “gives her dignity and autonomy. UNFPA supports the provision of family planning counselling and commodities around the world. UNFPA also supports comprehensive sexuality education and youth empowerment programmes, including the Action for Adolescent Girls initiative, which helps girls advocate for themselves.